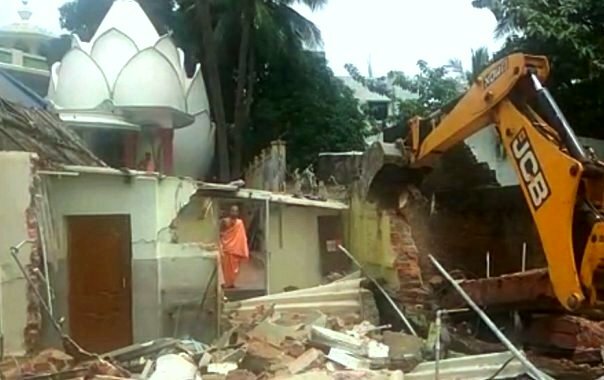 ONI Bureau: The joint enforcement squad of Bhubaneswar Municipal Corporation (BMC) and Bhubaneswar Development Authority (BDA) today demolished the area encroached by ISKCON temple in the Capital City. A memorial (samadhi peeth) in front of the ISKCON temple was also demolished during the encroachment drive. As per report, the illegal encroachments will be demolished in the city from Indradhanu Market to Jayadev Vihar area. Worth mentioning, BMC had earlier served show cause notices to the ISKCON Temple and Hotel Presidency managements on July 25 in view of the water logging problem on NH-16 in front of the ISKCON temple near IRC Village, Nayapalli in Bhubaneswar.